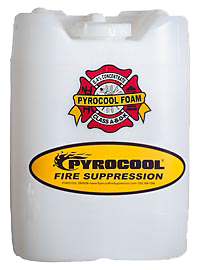 Pyrocool FEF is the premier multipurpose firefighting foam available today. Our FEF formulation can be used effectively against fires involving all types of Class B flammable liquids, including unleaded gasoline with MTBE additive as well as on highly volatile hydrocarbons such as military jet fuel. Unlike typical fluorochemical agents, firefighters can rely upon FEF to reduce burnback and reignition concerns and can use FEF effectively against pressurized, three-dimensional, and running fuel fires. No other fire suppression agent can match this versatility. Further, Pyrocool FEF works against a variety of Class D combustible metal fires and, of course, is effective against fires involving ordinary Class A materials. 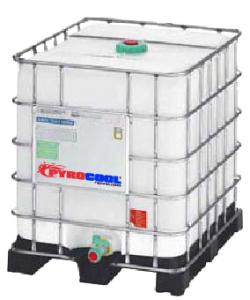 Pyrocool FEF is intended for use at 0.4% in solution with fresh, brackish, or saltwater. This amazingly low concentrate to water ratio reduces acquisition costs, reduces shipping costs, reduces storage requirements and reduces container disposal costs without sacrificing firefighting performance. Unlike AFFF, no after-use costs (environmental clean-up) are associated with the use of Pyrocool FEF. 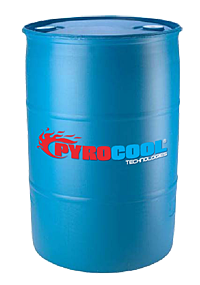 Available as an option only for Pyrocool RTU formulations, a pressurized 400ml container offers retail consumers the firefighting power of Pyrocool FEF in an easy-to-use package that fits almost everywhere. Great for kitchens, garages, dorm rooms, vehicles and boats. Pyrocool Spray Extinguishers represent the ultimate in portability, usability and effectiveness. Pyrocool Technologies has also been awarded the Presidential Green Chemistry Challenge Award. Height OAL:14.25 inches (36.195 cm. Pails fit easily into most firefighting vehicles and can be used both in batchmix and eductor scenarios, making them ideal for first-responders. Rugged and reusable, pails provide the maximum volume of foam concentrate which can be handled by an individual without the use of a forklift. These PYROCOOL FEF Pails are fabricated from Premium High Density Polyethylene ( HDPE) are Certified to UN – Y1.8/100 and have a molded handle so it can be lifted with turnout gloves on. Special integral M&F stacking rails are molded-in on top sides and bottom sides to allow safe non-slip stacking even when very wet. The heavy duty screw-on cap of the 2 inch entry port, fluted to allow a good grip, has an integral sealing fascia. A drum offers high foam concentrate volume in a rugged, field-usable package. A full drum is heavy and bulky, though, so drums are best suited for storeroom use or for applications where eductor use is anticipated and initial deployment time is not the most critical factor. A tote provides the maximum product volume with minimum shipping cost and minimum storage space requirements.